Understanding how early humans developed their capacities of expression which led to emergence of the language which sets us apart from other species was the topic of an article published in the Frontiers in Psychology journal in February this year. 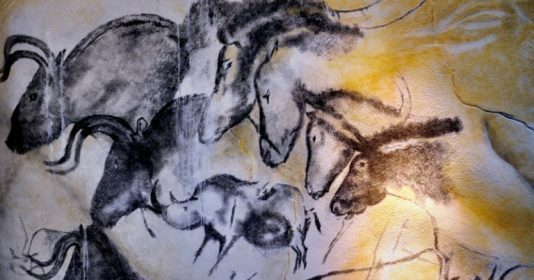 Led by researcher Shigeru Miyagawa, a professor from the Massachusetts Institute of Technology (MIT), in the USA, with the participation of linguists Cora Lesure (MIT) and Vitor Augusto Nóbrega, from the School of Philosophy, Letters and Human Sciences (FFLCH) of USP, the study suggests cave paintings represent a modality of language expression. The so-called rock art is one of the terms for the oldest known artistic representations, the oldest of which date back from the Upper Paleolithic (40,000 b.C.) and were drawn on rocky walls and ceilings of shelters or caves. According to scientists, the secret for understanding the leap taken by humans towards language might have started within those small spaces. ‘We take up the topic of cave art and archeoacoustics, particularly the discovery that cave art is often closely connected to the acoustic properties of the cave chambers in which it is found’ the researchers explain in the introduction of their article. 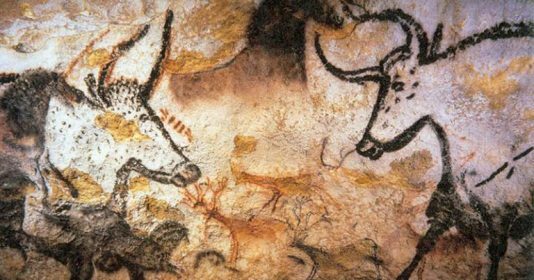 For them, ‘early modern humans were able to detect the way sound reverberated in these chambers, and they painted artwork on surfaces that were acoustic “hot spots,” i.e., suitable for generating echoes’. Based on that, linguists argue cave art is “a form of cross-modality information transfer, in which acoustic signals are transformed into symbolic visual representations”. That is, it is the first sign of “how the symbolic mind of early modern humans was taking shape into concrete, externalized language”. A linguist graduated from USP, Nóbrega started his academic career studying how compound words, such as “glass cleaner”, “swordfish”, etc., were formed in different languages, and which the minimum requirements were for forming them in any language. In his doctoral studies, his focus shifted to how human beings managed to considerably expand their vocabulary, a field known as Biolinguistics. The contact with Professor Miyagawa started from this work. As he tried to understand how we develop what he called lexical competence — the knowledge and capacity to use the vocabulary to form sentences in a language — the linguist went deeper on studying the origins of language in an attempt to uncover how it developed in the context of evolution, a mystery yet to be solved by scientists, and which has intrigued researchers across the world. “There are reasons to believe the cognitive underpinnings for the development of a symbolic consciousness were available at the time of the emergence of the Homo sapiens around 200,000 years ago”, he says as he emphasizes recent discoveries suggest the Neanderthals — an extinct human species — also possessed symbolic consciousness. “Our starting point is a hypothesis defined in several works on archeoacoustics, which suggest the location and subject matter of cave paintings are intimately related to the acoustic properties of the environment in which they were made”, he explains, and gives as examples hoofed animals, such as bulls or bison, which generally are drawn in chambers whose acoustic reverberations sound like hoof beats. It is not a coincidence there are cave walls which would have been perfectly suited for painting, but which were ignored because of the acoustic properties of the cave chambers. Generally speaking, early humans painted not only what they saw, but also what they heard. “Archeoacoustics is not the only hypothesis; and not all paintings features acoustic properties like this one. But there is a relation between the location and the subject matter with significant statistical outcomes”, argues Vitor as he stresses the research suggests cave artists already made use of a reasoning which “stemmed from symbolic consciousness”. “Based on that relation, we suggest the mechanisms these cave representations seem to display are a parallel to what allowed us to develop human language through speech and signals”, he sums up. Coincidently, at the same time his article was released, two other studies had an impact on the scientific community for they managed to prove cave paintings could be older than previously thought, dating about 60,000 years ago, when the Homo sapiens did not exist in Europe. That means the Neanderthals might have been the first artists. With that new information, scientists now need to think about how this competence sprang up at the same time in two different species. Even if cave art cannot be seen itself as language, Nóbrega says its production might suggest “the mechanisms underlying the production of painting run parallel to the production of language”. Then, we need to see them from a multi-sensory point of view, so we can identify correlations concerning how these paintings represented an advance which might have promoted human language. Just like archeology might be viewd as a reconstruction — as archeologists dig for new evidence to either confirm or disprove historical hypotheses — “the study of language formation is also a reconstruction”, argues Nóbrega, as he highlights Linguistics is an “extremely interfaced” field in which one needs to pay close attention to discoveries being made in archeology, biology, psychology, among a diversity of other fields. Despite that, “unfortunately, we will never have any direct evidence of what the first form of language used by the species was like”. However, we can examine the relation between archeological records, cave paintings, and the cognitive processes needed for them to come up. It is from this investigation “we can shed light on the timeline of human evolutionary development”, he remarks.